1 photographic print : b&w; ; 5 x 7 in.1 negative : b&w; ; 4 x 5 in. 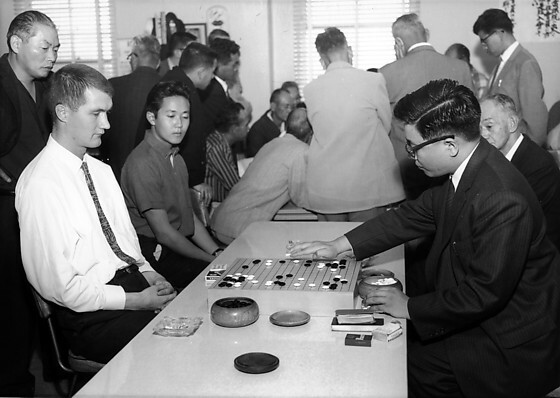 Caucasian man and Japanese man play Go in a tournament held at the Gokaisho (Go center) in Sun building in Little Tokyo, Los Angeles, California, October 7, 1962. Caucasian man, left, in white shirt and patterned necktie sits with hands clasped in lap as he watches Japanese man, right, in suit and eyeglasses place a white game piece on the board. Three men watch game on table in center. Crowd in background watching another game. Typed on original negative envelope: Goh Tournament at Sun Building. Sun building became the New Otani Hotel and changed its name to Kyoto Grand Hotel and Gardens in 2008.